It’s grilling season, there is no doubt about that! With the beautiful summer weather, tons of get-togethers, cook-outs, and BBQs, those of us with food allergies may feel like our safety is going to be compromised. Rest assured, that does not have to happen! Here are some simple tips and pointers to help you keep gluten-safe as well as allergy-safe! I haven’t been to a BBQ this year, but I have been grilling up a storm here at home. And I finally learned how to turn the gas grill on myself the other day 😉 Now I can get at it anytime I want! I even offer to grill my brother something for dinner if he wants. Grilling can’t be easier and I think I have it down pat now. But my #1 tip really is to use foil when you grill! Just rip a good piece off, oil it with some coconut oil or EVOO, place you meat or veggies, or even pizza down on the foil and then place the foil on the grill rack. Done, safe, and clean! No cross-contamination. This is even more important for us since my mom has a seafood allergy to. So if and when I start grilling fish, everyone can feel safe, not just gluten/meat wise. Another thing I should warn you about is using a wire brush to clean the grill. If you do, stop! The bristle can become loose and actually cook on to what ever you are grilling if you grill directly on the rack. Thus your eating metal…bad! If you grill on the rack, use an oiled rag, held by tongs, and lightly wipe the rack to clean and oil it at once. But in all honesty, just use foil! You may not get the best grill marks, but it still gets all the wonderful grill taste! Now. Sometimes grilling doesn’t always happen. Like when the gas runs out and your dad isn’t home to fix the situation. 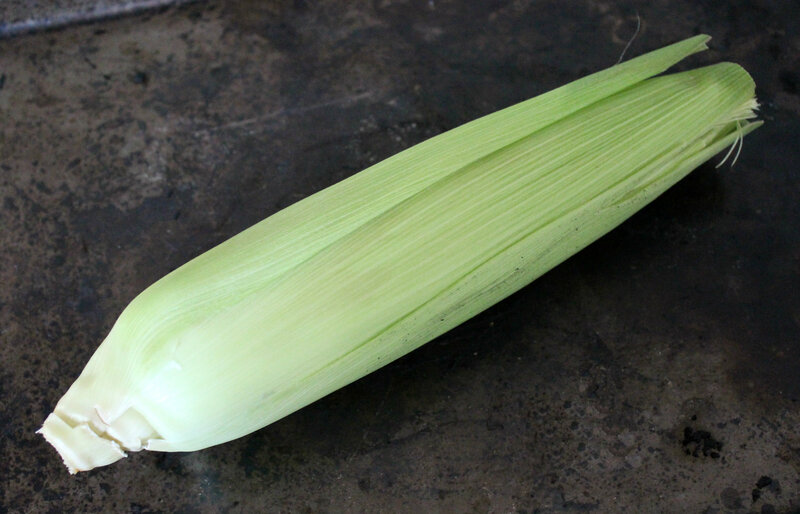 Plus you have some beautiful corn on the cob that needs to get cooked. What do you do? Cook it in the oven! No grill, no soaking, simply turn the oven on, place in the corn, 30 minutes later and you have heaven in a husk! A.K.A. the best “grilled” oven-baked corn around. Lazy-Girl Corn if you will. + Pre-heat oven to 350°F. + Remove any loose husks and trip any hanging strings form the top of the cobs. 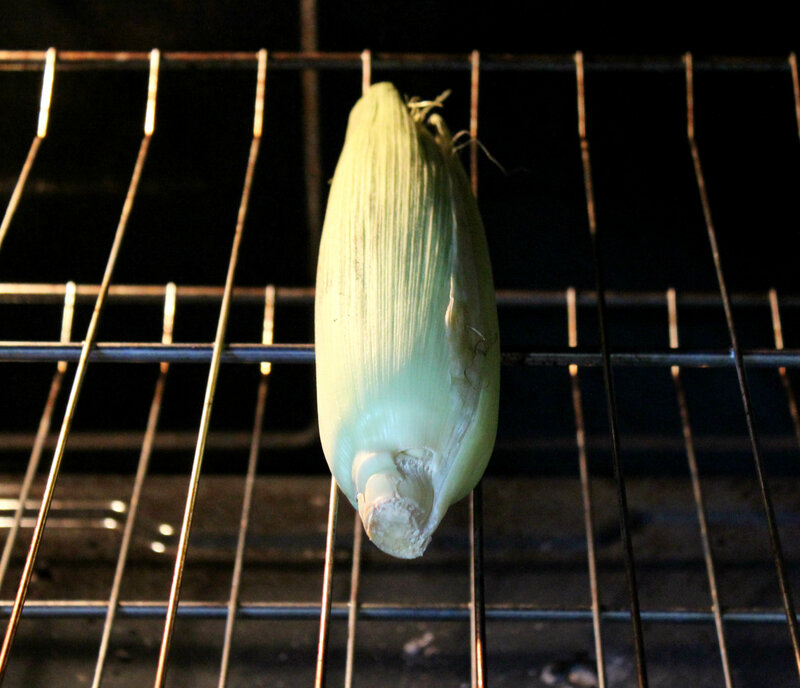 + Simply place each cob directly on the oven rack. Close the oven door and bake for 30 minutes. + Remove each cob with an oven mitt. Allow to cool for a bit before simply peeling down the husk. Clean the husk, trim, the tip strings off. Place directly in the oven at 350°F and cook for 30 minutes. Take it out and try and tame yourself while it cools! 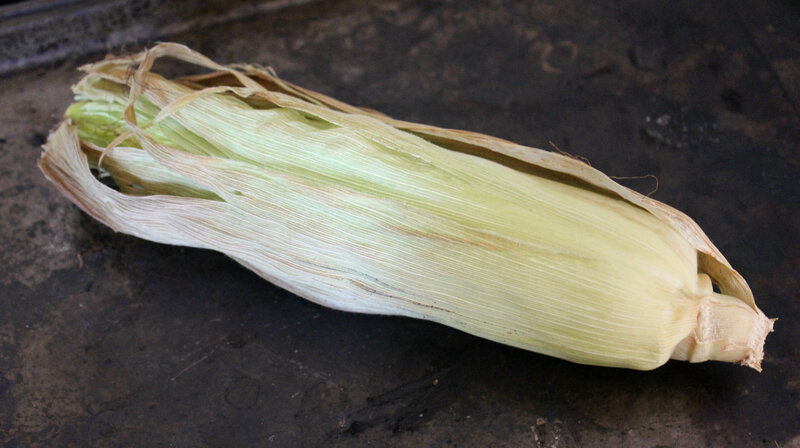 Peel off the husk to reveal perfectly cooked/steamed corn! All without the grill, but with all the taste! I think I went all of last summer without ever having corn on the cob! I know…blasphemy! But don’t worry, this year I am making up for it! I forgot just how lovely fresh local corn can be! And a plus to cooking it this way is that it doesn’t seem to get stuck in your teeth as much! Maybe it’s just me, but I really think it is the cooking method! 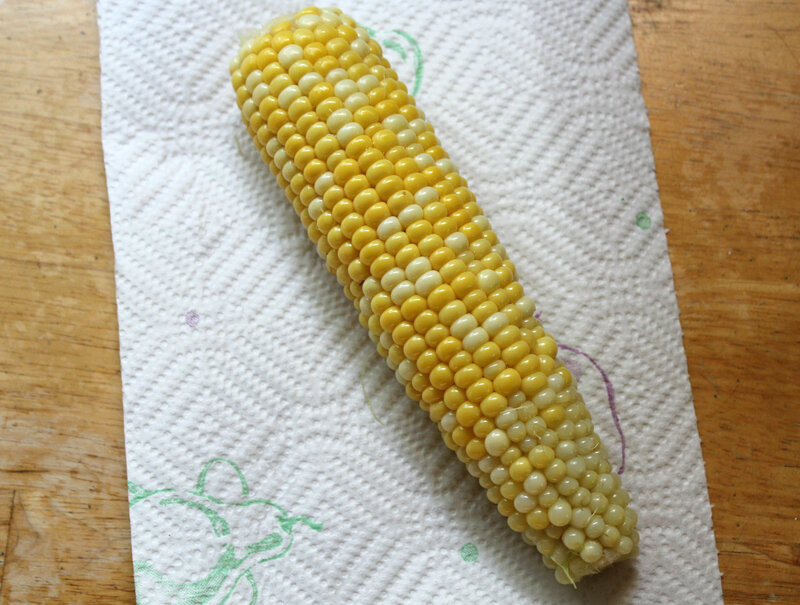 Do you all remember having to cut the corn off the cob when you had braces since it was “against the rules” to eat corn off the cob then. O the horror. Corn on the cob must be eaten on the cob! It is the quintessential summer food! Am I right? + Have any other allergy-safe tips to share with the class? + How do you cook corn on the cob? How do you eat it? 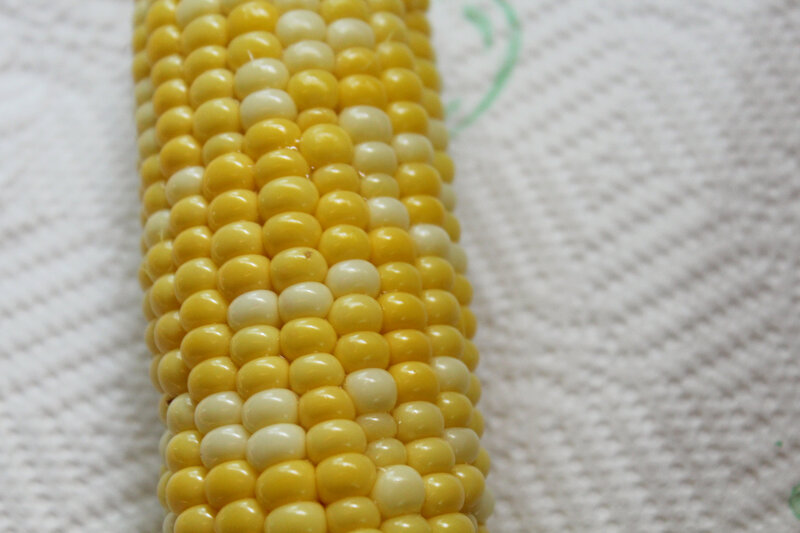 Directly off the cob or do you cut the kernels off? Thanks for sharing at Healthy Vegan Fridays! I have pinned your recipe on our Pinterest Board. There is something so magical about corn on the cob in summer! Love these tips!! Thank you so much for linking up at Tasty Tuesday! Your recipe has been pinned to the Tasty Tuesday Pinterest board! Please join us again this week! I so wish I could have a grill in my condo. Alas, baked corn it is! This looks so easy – I love it! Yes! Its the perfect solution! And you need a George Foreman! Oh, I have one of those. It’s been my friend since college! Grilled bananas, veggies or mango are also a fave! Even if out grill wasn’t 10000 years old and who knows what has been grilled on it, it didn’t meet my food free expectations so I will always use foil….for life! Ah, I love this idea for cooking corn on the cob! Husking and steaming it takes so long! This way is fool proof! Foil is the allergy Queen’s best friend 😉 I’ve even asked for it in restaurants! I really need to try grilling it like this – sounds delish! Whenever one of my gluten-free needed family members come over, we grill the whole meal gluten-free just so it’s safe. We usually do chicken, a potato and a vegetable… all on the grill! Simple salt/pepper/olive oil are always winners. That’s great! But even so you should always use foil if your grill hasn’t always been g-free! I’d never tried corn that way before! I guess you could do the same on the grill? Well, that’s the point, you don’t need the grill! I love grilled corn 🙂 If I don’t grill it, I’ll boil it on the stove and let it soak for a little bit. Adds some more juice to it! i always make mine in foil. Easy to keep away from gluten, yes? 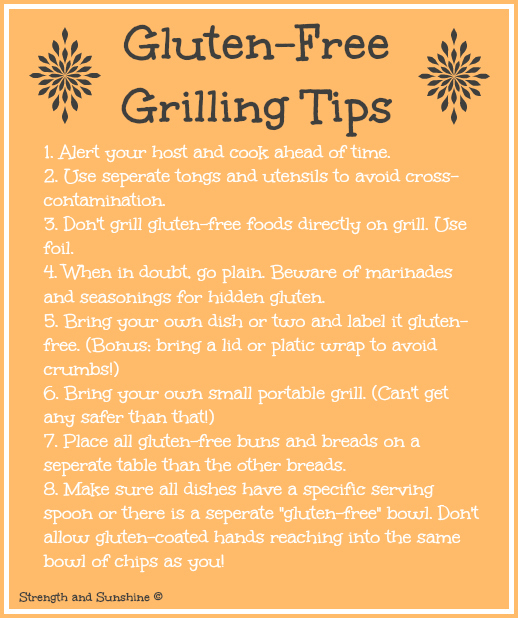 Great gluten-free tips for grilling! Cross-contamination on the grill (gluten or whatever the allergen) is no joke! So glad you are talking about this subject. Its so easy to forget about these things when all we want to do is enjoy the summer and great time together! But safety has to always come first! We don’t have much cross contamination on our grill obviously, but I’m so picky about not having my chicken touch the same rack as a piece of beef or something I’m against eating!